The situation in the market has become one where Bitcoin is trading on relatively low volume without major moves. But the currency is in a very important place. Actually, Bitcoin is simmering slowly. Will it boil? Will this increase the profits on our hypothetical positions? If this seems crazy, then maybe it is. A bit. On the other hand, if you have a sizable position in Bitcoin, then cold storage and, more specifically, an actual vault might be the way to go. This is mostly important for the insurance part of your portfolio. Even if don’t have access to services like Xapo, it might be a good idea to hold part of your coins in cold storage. A simplest idea would be an external USB stick or hard drive without connection to the Internet. The problem with this, of course, is that you have to keep track of where the drive is, unless you can put it in a safe location (e.g. an actual safe) and you have all the same problems you would normally have keeping large amounts of cash at home (risk of robbery, etc.) This is why other kinds of storage services might enjoy some interest in the future. Even if it’s not apparent at first sight, this has implications for Bitcoin traders and investors beyond the insurance part of one’s portfolio. For instance, the fact that 7% of the global Bitcoin supply is held at Xapo, and possibly more in other cold storage services, makes Bitcoin a bit more similar to gold, which has a similar curious characteristic that it’s mostly dug up from the ground only to be stored in vaults. Another implication which can be drawn from this is that it is the investment or speculative trading that determines the price of Bitcoin. In other words, for the time being, the fact that Bitcoin is used as a channel of payments or the fact that the supply of Bitcoin is fixed might not have a direct impact on the price of Bitcoin but rather an indirect impact of honing speculative moods. On BitStamp, we’re seeing the rally from around $7,000 to $9,000. It seems that the move lost momentum around $9,500 and the currency moved to $10,000 on relatively small volume. This is a bearish sign, albeit not a particularly strong one. But we have a stronger one in the form of the 38.2% Fibonacci retracement level. This level is not a deal breaker, but it currently is the closest level which might have implications for the short-term. First of all, a move above this retracement could result in a short-term rally. This is not what we’re seeing now, though. What we have seen so far is a move above the 38.2% retracement on April 24, 2018, denied one day later, a repeat of the move up on May 3, 2018, and a repeat of the invalidation on May 7, 2018. If you count the move on April 29, 2018, then we have three tests of the 38.2% retracement, all of which failed. The fact that Bitcoin is testing this level relatively frequently suggests that it might be an important one and the failed moves up hint at a possible decline in the weeks to come. On the Bitfinex chart, we see that the recent rally brought Bitcoin around $10,000 but the currency stopped at that level. 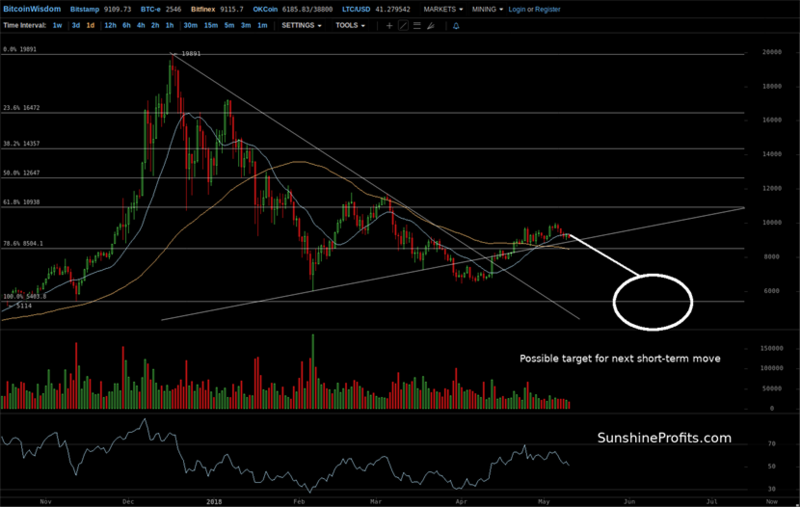 $10,000 is a psychologically important level, a resistance level at this time. 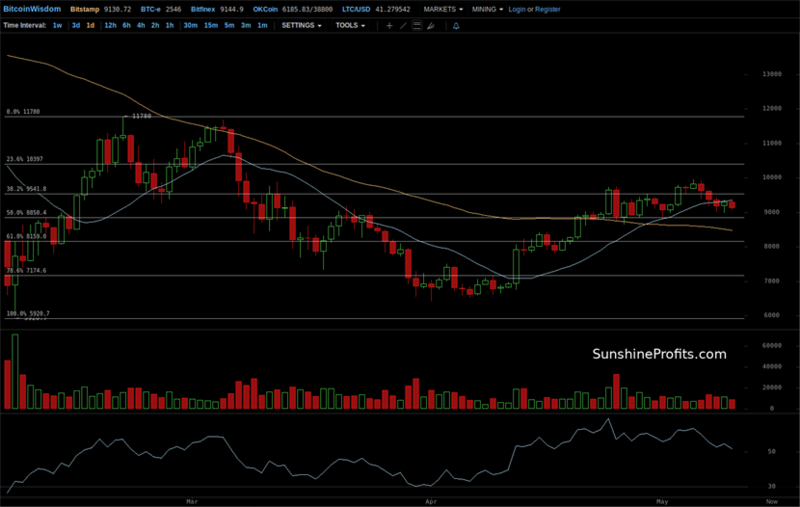 The fact that $10,000 stopped the recent move is a bearish indication. But there is more than just $10,000 to the rally. Generally, the rally from $7,000 to $10,000 is seen in proper perspective on the above chart. Bitcoin is above the 78.6% retracement level, which is a slightly bullish indication since this level is not a particularly important one. Perhaps more importantly, the 61.8% retracement level has not been touched and it still acts as a ceiling for the recent move. This is a bearish indication as not much has changed in the last couple of days. There is one more factor that comes into play at the moment. It’s the support line based on the February and March lows. Bitcoin is now quite close to this level. If we see a move below, we might actually get an acceleration of the decline which has been simmering slowly for the last couple of days. Summing up, even thought we’re not seeing much volatility, a small move lower might trigger substantial declines, making the profits on our hypothetical grow even further.